This is the way the world ends, with humans turning into zombies and hungering for the flesh of the survivors. But... what happens next? You see, eight years after the world came to a shuddering halt, here we have survivors. More than that, the zombie threat has been fading away. Humanity has survived. So what is the next step? That's the starting point for Daniel Humphreys' humdinger of a tale set in an America many years after the plague that ravaged the globe. A walled community has more or less come to terms with how to deal with the zombie threat - and faces threats from within its own walls as the need to bind together for day-to-day survival starts to drift into the kinds of things that people do when they start to become too bored, or when they start to snap under the constant strain. The community may just be becoming its own worst enemy. Humphreys rattles through the action sequences here, and depicts the detail of the world of the survivors. There's something of a wealth of detail when it comes to military hardware - you'll find detailed descriptions of the guns on show for starters, and their loadout in terms of bullets, choice for penetration, types of scopes and so on. Whether that sways you for or against, be aware there's plenty of that. A lot is in context though of these hardened fighters and the tools they use to stay alive. Humphreys has a good writing style - I think he crams in a few too many characters and definitely two or three too many subplots that could have been trimmed to give the book a better pace, but this is a good, solid read, and offers a refreshing new twist to the traditional zombie apocalypse tale. Well worth getting your teeth stuck into. 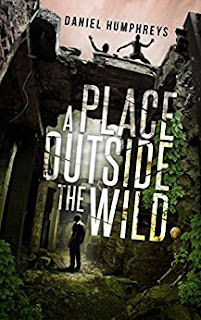 A Place Outside The Wild is available on Amazon here. I picked up Them: Aberration thanks to an Instafreebie offer - and I'm jolly glad I did. 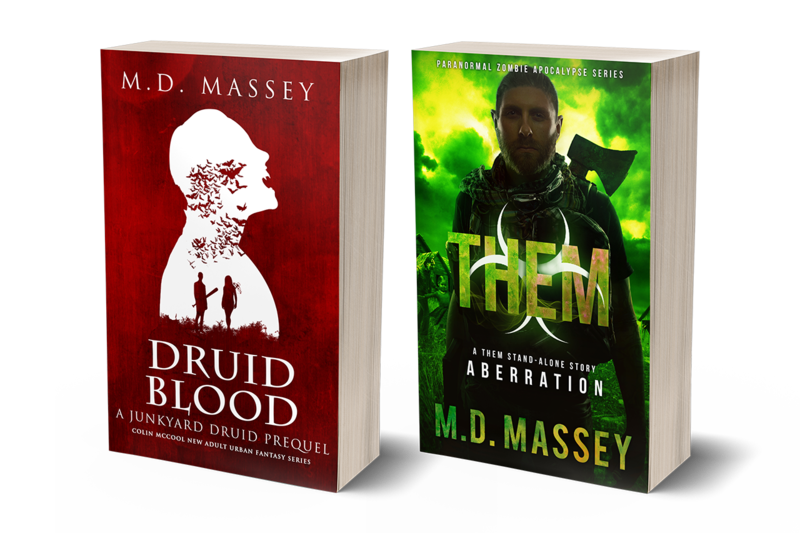 It's a short story in Massey's Them universe, featuring war vet turned undead hunter Scratch Sullivan, who is hired to come and rid a town of an unwanted presence. Everything is not as it seems though, and while Sullivan sets to his task of tracking down his target, he soon discovers there is far more afoot here than the townsfolk are letting on. This is a nice introduction to Massey's post-apocalypse world. There's almost the feel of a mournful Western to it, it's thoughtful and tackles weighty issues despite its length. 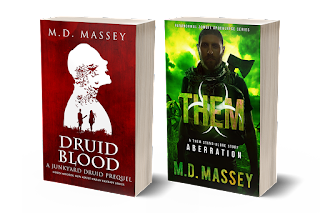 You can also pick it up for free - along with Druid Blood, also pictured above, over on Massey's website, here. For a free story, it certainly made me think, and it's a very welcome enticement to dabble more in the book's universe.